Chaudhry Zulfiqar Ali, the prosecutor who investigated the assassination of Pakistan’s former Prime Minister Benazir Bhutto, was shot dead by two men on a motorcycle in Islamabad Friday, local media reported. Zulfiqar died in hospital, while an unnamed woman was also shot dead, and the prosecutor’s bodyguard was injured. Zulfiqar, a special prosecutor for the Federal Investigation Agency, had received threats last year along with other investigators working on the case, the Dawn daily newspaper reported. Bhutto, 54, was assassinated in 2007 at a rally ahead of presidential elections, in which she was a candidate. The government blamed al-Qaeda’s affiliates for the murder, but then-President Pervez Musharraf was also implicated, with a court issuing an arrest warrant for him on accusations that he was aware of the upcoming assassination attempt, but did not inform Bhutto. Bhutto was Pakistani prime minister in 1988-1990 and 1993-1996, becoming the first woman to head a predominantly Muslim state. She spent nine years in exile after losing a power struggle and facing corruption charges. 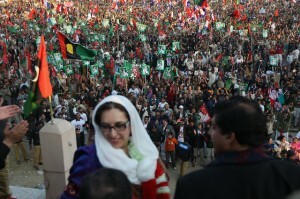 She returned to Pakistan in 2007 to run in the presidential elections.